Remember back in October of 2009 when Obama intervened to bring the Olympic games to his hometown of Chicago =FAIL, or when he personally went to Copenhagen to intervene in the climate summit to inspire the world’s leaders to come to an historic agreement to reduce emmissions = FAIL, or the countless late election interventions for Martha Coakley, Governor Corzine, Creigh Deeds, and Tom Periello = FAIL, FAIL, FAIL, and FAIL. 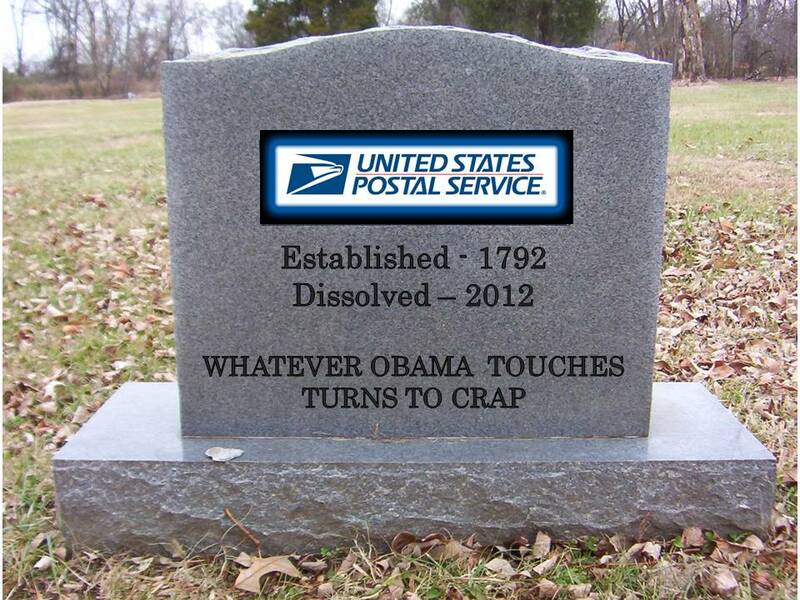 Well now that the United States Post Office and it’s declining receipts and expanding retirement liabilities is on the brink of default (much like Martha Coakley, their demise is largely self inflicted) it is Obama to the rescue. According to Rueters, our dear leader has pledged to craft a fix. The president wants Congress to delay for 90 days a $5.5 billion retiree health benefits payment due this month so he can carefully work through the details and develop a proposal. As usual, the Obama administration prefers to wait until this predictable situation reaches a crisis (see Rham Emmanuel) level before addressing this issue leading Senator Susan Collins to complain saying,”I just don’t understand why the administration doesn’t have a concrete plan to put before us today given the dire straits that we’re in”. Talk show host Mark Levin said it best when commenting on Obama’s reverse Midas touch stating, “whatever Obama touches, turns to crap”. On a day when Gallup released new poll numbers showing that the number of uninsured Americans has increased since the passage of Obamacare, the president has committed the resources of his administration to do for the USPS what they did for Solyndra Inc. The E*Trade baby learns what most of the fools who voted for Obama already know; you can’t take it back. I think I’m going to be sick. Update: Well, it seems that the folks at E*Trade have NO SENSE OF HUMOR and have taken this YouTube down. Would it have killed you to give a guy a warning bark? Nobody knows the trouble I’ve seen. Update: It’s back. Maybe my little note to E*Trade about them not having a sense of humor helped. Probably not, but maybe my note to them was joined by many more. Good for you, E*Trade!! Oh fer. Hussein. Obama. Mmmm. Mmmm. Mmmm. “Bracket” Obama has not only bombed in Libya and bombed ON Libya, but little VCU called in an airstrike on his last choice in the NCAA basketball tournament…Kansas. Joey Rodriguez from VCU said that Obama’s choice MOTIVATED them to upset the last of his NCAA picks. Coach Shaka Smart used the Obama quote to pump up his players. He showed his players motivational clips of everyone who said the Rams should not have gotten a tourney berth. He showed them clips of analysts continually picking VCU to lose. For his final message, he used The First Doubter himself, Barack Obama, showing the team a pregame ESPN clip of the president picking Kansas to win it all. Khadaffi is running the same video in Libya, I hear. Even Sports Illustrated couldn’t help but kick sand in the face of our 98 pound weakling President, with their Obama goes 0-for-Final Four headline. Teh Bracketz were the most important thing in Obama’s life when he shared his well-publicized picks on ESPN at the expense of his role as Commander-in-Chief, motivating his Troops or explaining to the American people why he was committing us to his adventure in Libya. But. He had his reasons. He had to cement himself at the bottom of the NCAA pickin’ class, which he was quite accustomed to throughout his, ahem, Kollege Kareer. Who knows? It’s a state secret. I say he was a loser. Bottom of his class. There’s no evidence to the contrary. He’s our national affirmative action hire. But you all knew that. But, tomorrow His Petulency will forecast his predictions about Khadaffi and Libya, having to interrupt his intense schedule in order to once again lay out his world vision to get us hayseeds up to speed, giving us a glimpse into his immense wisdom. Let’s just hope it turns out better for us Americans than his predictions about roundball. The Sports people are calling it the Obama Curse. They have no idea how correct they are.